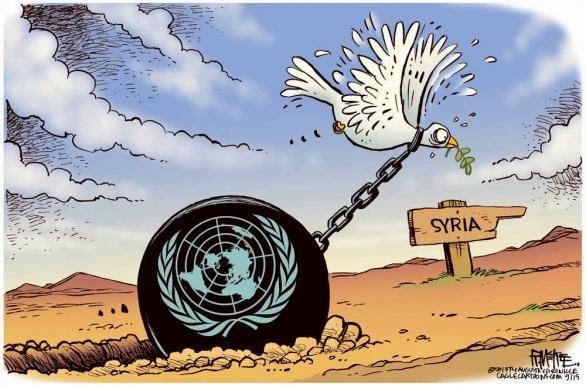 McKee is the third American to win the The United Nations/Ranan Lurie Political Cartoon Award and its $10,000 prize. This is the ninth year for the award, named for Lurie, a syndicated political cartoonist who worked for The Wall Street Journal, Newsweek, The Times of London and Life magazine. McKee said he was pleased the judges gave first place to a cartoon that criticized the organization. Among the panel of judges were former U.N. Secretary-General Kofi Annan, former Soviet Union President Mikhail Gorbachev, actor Jeff Bridges and 42 U.N. ambassadors. McKee finished in second place in 2011 and was given a citation for excellence last year.